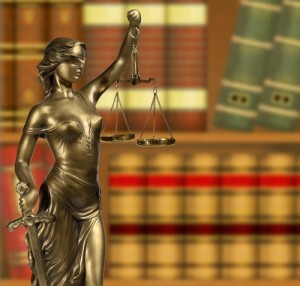 Denver Tax Attorney - Why Hire Us? Committed to helping people resolve their tax matters as favorably and efficiently as possible. When you need to clear up serious IRS tax matters, you need the Denver tax law attorney at Goldman Law, LLC. Expert advice regarding their best options for moving forward and obtaining the best possible outcomes to their pending tax issues. 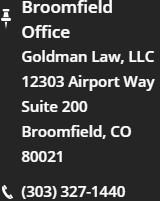 The bottom line is that, when you need to clear up serious IRS tax matters, you need the Denver tax law attorney at Goldman Law, LLC. He will aggressively defend your rights and will work diligently and relentlessly to help you resolve your tax issues as beneficially as possible. Our Denver tax law attorney is ready to meet with you, discuss your tax issues and help you figure out your best options for moving forward and resolving these matters. 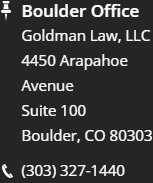 To set up an initial consultation today with the trusted, experienced Denver tax lawyer at Goldman Law, LLC, contact us by calling (303) 656-9529. You can also reach out to us by email, using the contact form on this page.